The tubes are in! Here's to another 18-24 months of ear infection free time. Thankfully, today's procedure when incredibly smoothly; he was in and out in about 15 minutes. Waking up from the anesthesia, however, was a little rougher. After a few minutes, we got him dressed and they let us leave. Once we were home, he was back to himself, resting up, and watching movies. I realized that this is Charlie's 3rd surgery in as many years. Not nearly as many as some little ones out there, but I think I still have a bit of helpful information to share. 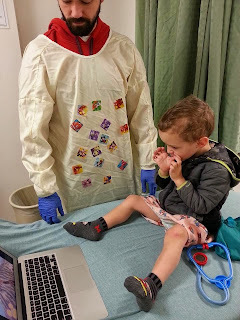 Keep in mind, these are tips I've gathered from our experiences and all hospitals and procedures affect the experience, not to mention the age of the child. Over the past three years, Charlie has had a hypospadias repair (June '11), tubes and adenoidectomy (June '12), and today's tube surgery. 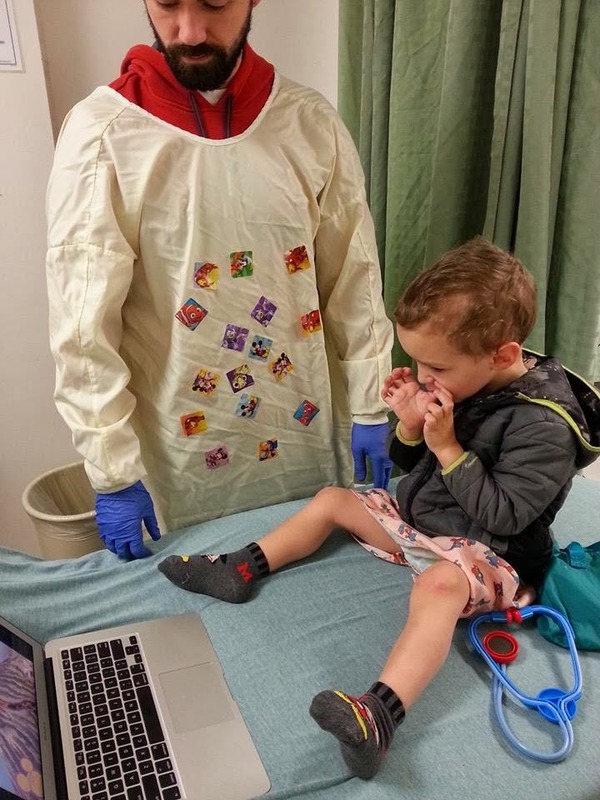 Finding out your kid needs surgery, regardless of how minor, can be stressful. Take advantage of your doctor when they ask, "Do you have any questions?" Write down questions as the appointment approaches and keep a list even after you've met. There's no shame in calling the office before the procedure to answer any questions you have. As for hospital or surgery center procedures, you'll have an opportunity to ask during pre-surgery interview and/or hospital registration the week prior. How do we prepare him for surgery the day before/day of? What kind of anesthesia will be used? What safe guards to you take with little kids? How long can we stay with him leading up to the surgery? Where can we wait during the procedure? How soon afterwards can we see him? What will he be like waking up from anesthesia? Will he be in pain afterwards? What kind of pain management will be available? What can we expect the first 24 hours? 48 hours? Week? What restrictions will he have on his activity? Diet? for a few months after his first set of tubes. More often than not, you'll receive discharge orders in written form with some of this information. Read them before you leave and ask any clarifying questions you have. You can always call later if something else comes up. After getting information from your doctor about what to expect, gather up supplies you might need before you head in for the big day. Pain medication, ice pops, gauze, even diapers - whatever your little one may need for recovery. Its no fun having to run to the store post-op because you forgot something you need. Considering what your child is afraid of can help you focus your conversations about and prep for the surgery. For Charlie, he gets very anxious with a lot of strangers around and when things have to be done to him that are out of his control (checking his ears, taking his blood pressure, or even getting a hair cut or sometimes brushing his teeth, etc.) Perfect storm, huh? To help ease these anxieties we bought him a doctor kit for Christmas and talked to him about how we were going to the doctor and that the doctor would fix his ears. 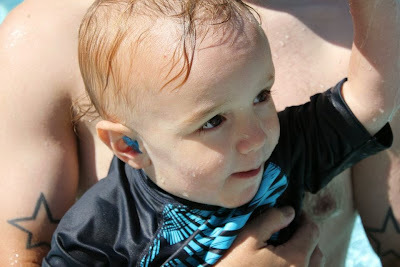 At this age, he can understand that his ears hurt and what the concept of "fixing" was, so he was amiable to the idea. You will know best what will work for your child, but here are some other ideas the nurses gave us as we were scheduling his surgery. Don't give your little one too much time to think about it. Talking about it a day or two ahead of time is plenty of time for a toddler to process it without having time to worry. Ask if you can take a brief tour of the surgery center. I remember my sister going on a tour like this when she got her tonsils removed as a youngster. She tried on a gown and hair cover, got to hold the anesthesia mask, etc. Read books about doctor visits or going to the hospital. "A Visit to the Sesame Street Hospital " by Deborah Hautzig was recommended to us as a good general book for little ones. A few ear tube specific books are "Tubes in My Ears: My Trip to the Hospital " and "Chris Gets Ear Tubes ." There are also several tonsil and adenoid specific books like "Good-bye Tonsils! " and "The Surgery Book " if that's the procedure you're facing. Buy a children's doctor kit and play check up. We bought Charlie the Fisher-Price Medical Kit for Christmas. Depending on the type of anesthesia being used, your child may not be able to eat or drink for several hours before hand. Because of this, when offices are scheduling they try to get the smallest kids in earlier for surgery. Charlie's first surgery at 7 months old, he was the first case at 7:00am. The second, he was called in around 8:00am, and today's surgery was at 9:30am. He couldn't eat anything past midnight and couldn't drink anything past 5:00am, but he did surprisingly well as we waited for everything to get started. We at our breakfast before he woke up and didn't mention eating and he didn't ask. We asked ahead of time and found out that Charlie could bring a comfort object like a stuffed animal or a blanket, so he chose to bring Goofy with him. We also brought my laptop to watch Little Einsteins, his doctor kit, and a few other activities to distract him while we waited. The nurses gave him stickers (which he used to decorate Daddy) and a coloring book. Jeff and I brought some things to keep us occupied in the waiting room, though our wait was minimal. If at all possible, I recommend bringing another adult with you for surgery day. Kids can be unpredictable after waking up from anesthesia - some are sleepy and cuddly and some, like Charlie, are writhing, pissed off, incoherent messes. We took turns holding him in recovery until they released us. It was also very helpful for Jeff to bring the car around while I got Charlie ready to leave. Tiny post-op Charlie. He was never a post-op cuddler. Always pissed. Recovery will vary from person to person and procedure to procedure. The important thing is to be patient. Your normally chill kid might be inconsolable and clingy for a day or two. Their activity might be restricted or medications might be on a round the clock schedule. With Charlie's hypospadias repair, he couldn't sit in any kind of crotch restricting seat or carrier for 6 weeks. A 7 month old, who could not sit up yet, couldn't sit in a bouncer, jumper, or baby carrier? Let's just say it was a long 6 weeks! With Charlie's tube surgery, there are no restrictions on activity and he will bounce back quickly. Remember to take care of yourself as you help your little one recover. Charlie's surgery today was a breeze, but his previous two lead to a long first night of pain medication and crying. Jeff and I were able to trade off and get some rest while still helping Charlie as best we could. If your'e concerned about your child's recovery or have other children to juggle as well, call in back up ahead of time to stay for a day or two. 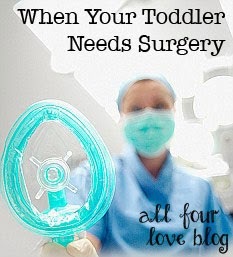 Surgery can be very scary for parents and for toddlers, but it doesn't have to be. All you can do is prepare yourself the best you can and be strong for your little one. If anyone reading this has specific questions about hypospadias repair or tube/adenoid recovery, please email me! I'd be happy to give a Mom's perspective. I hope you never need this information, but if you do, good luck and best of recovery to your little one! Wow!!! this was the best news I have read in quite a while. Reading this post reminded me so much of my own son. I have a two year old who is preparing for his 3rd surgery tubes and adenoidectomy on May 31st.. Prior to that, he as also had a hypospadias repair and a abdominal hernia repair.. I really am praying for great results as the previous ones and I appreciate your tips.. My question to you is was he born prematurely?? my son was.